Vaishnavi Sharma, Eric Tucker, James Patrick Nelson. Grace Bernardo, and Edmund Lewis in “Pygmalion.” Photo: Nile Scott Studios. CAMBRIDGE – The brilliance of the theatrical troupe that goes by the name Bedlam is its absolute concentration on the talents of its actors. The troupe eschews grand sets and props and relies on seemingly endless supplies of creativity and energy and a wide palette of theatrical skills in their fresh new takes on classics. “Bedlam’s Pygmalion” at the Central Square Theater through March 3 under the aegis of the Underground Railway Theater marks its fourth visit to the area after triumphant runs of “Saint Joan” at Central Square in 2015, the repertory duo of “Twelfth Night” and “What You Will” at Central Square in 2016, and “Sense and Sensibility” in December 2017 at the American Repertory Theater. One of the troupe’s trademarks is its delightful comic touches. In “Sense and Sensibility” cast members rolled about the Loeb Drama Center stage on the casters of office chairs to quickly get from one scene to another. It’s all great fun, but the spirit of the piece in question is never lost. 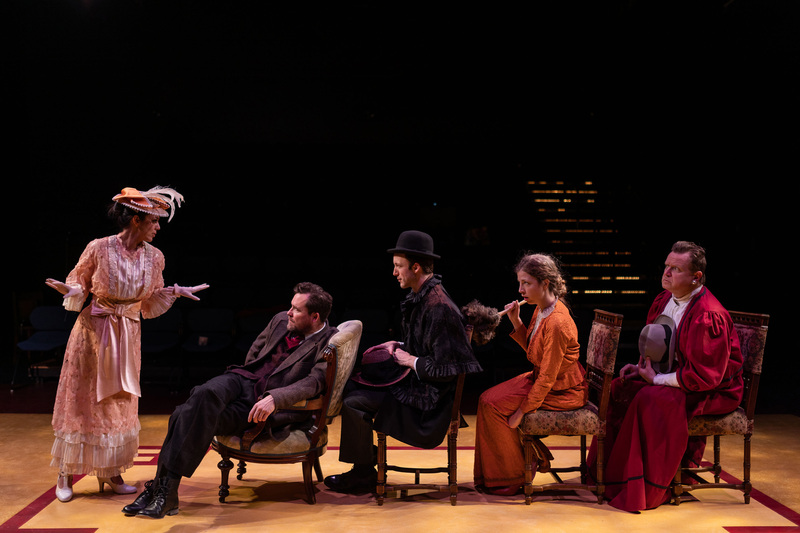 In “Pygmalion,” when the six-person cast requires a few extra bodies to populate a scene, it simply enlists theater-goers to recreate London’s Covent Garden in 1913 in the comedy written by George Bernard Shaw. Vaishnavi Sharma and Eric Tucker. Photo: Nile Scott Studios. The ringmaster of this theatrical circus is one Eric Tucker, who here dons the role of linguist Dr. Henry Higgins as effortlessly as he’ll don the professor’s slippers. Bedlam has tweaked Shaw in the decision to make the accent of flower girl Eliza Doolittle (Vaisgnavi Sharma) decidedly Indian rather than Cockney, in tune with her father Alfred P. Doolittle (Michael Dawn Singh). When Higgins decides to bet his good friend Col. Pickering (James Patrick Nelson, superb) that he could take the poor, dirty flower girl and turn her in six months into a duchess, the game is on. It is during the training of Eliza that gentlemanly, affable Col. Pickering will play “good cop” as the haughty, arrogant “bad cop” Higgins runs roughshod over Liza and any feelings of self-worth, even as the caterpillar transforms itself into a lovely butterfly, becoming the center of attention at societal gatherings..
Sharma retains her dignity even under the pile of indignities heaped upon her by Higgins and her fiery rebuke of Higgins – complete with tossed slippers – is one of the highlights of the production. There are also some delightful performances in the supporting roles. Men performing roles usually played by women can easily devolve into caricature, but not when they are performed by Edmund Lewis, a frequent collaborator of Tucker’s. His portrayal of Mrs. Higgins, Henry’s mother, is so spot-on that and detailed that it makes absolutely no difference that the actor playing a woman happens to be a man. He is equally adept as Freddy Eysnford-Hill, the lightweight but affable and ardent would-be suitor of Eliza. As Alfred P. Doolittle and a few other characters, Singh is simply sublime, especially as Doolittle, the self-styled “man of the world” whose attempts to extort Higgins run aground, and who eventually falls victim to “middle-class morality” when he becomes a noted speaker and decides to marry his common-law wife. Bedlam is famed for its actors’ abilities to switch roles at breakneck speed,with the inflection of the voice or the change of a hat. In “Saint Joan,” four actors played a total of 24 roles; it does require that the audience pay close attention and in some cases it helps if you’re familiar with the story going in. In one memorable scene here, Nelson switches back and forth between Pickering and Mrs. Eynsford-Hill, changing hats and voices on the fly. It’s all great fun and funny as well. 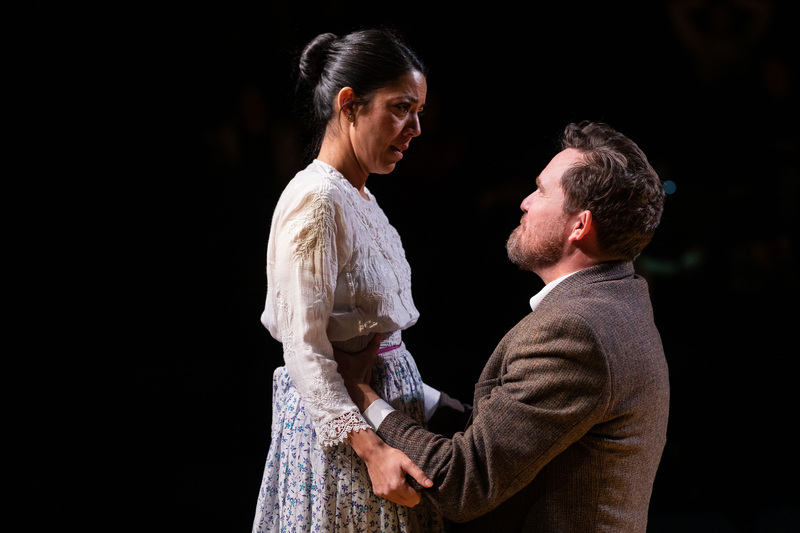 “Pygmalion” is yet another triumph for Bedlam, which took the occasion of the press night for this show to announce that it would be debuting its production of Arthur Miller’s “The Crucible.” at Central Square before taking it to New York City. Bedlam is often defined as a scene of uproar and confusion and indeed there are times when it applies to this production, but in the midst of the bedlam there is great theater performed by talented artists, and if you have a chance to see them in action and enjoy a timeless comedy at the same time – this would be a good opportunity – you should grab it.